So what sort of Langkawi map are you looking for? If you want everything together in one place, you will likely to get lost because the island has so many things like beaches & attractions, hotels, restaurants, landmarks and roads scattered virtually everywhere. We therefore prefer to look into a subject specific map... for example we would take a look at an Area Map to explore a specific area of the island like Pantai Cenang, Kuah etc, or see the Tourism Map when we are trying to locate an attraction or a beach, or refer to the Hotels Map when we are scanning the locations of hotels etc. However if you are looking for a printed map, it is best to pick up one from one of the official Tourism Information Centers in the island. They show fair amount of details including the roads with their names and numbers, petrol stations, important landmarks & attractions etc. You will also get printed maps virtually from every tour operator many of who have stalls along the road of Pantai Cenang. But expect the maps to be full of their own advertisements. Do not buy a map in Langkawi. I purchased a map called Langkawi Discovery Map created by Sunspot Productions Sdn Bhd and was disappointed to see that even a paid map has loads of advertisements of hotels and shops. The following map although looks very simple can help you uncover a wealth of information. First it gives you an idea about the important places in Langkawi. You can click on an area name in the main island and get complete information about the area including all its attractions, activities, top restaurants & hotels, shopping, nightlife and more. 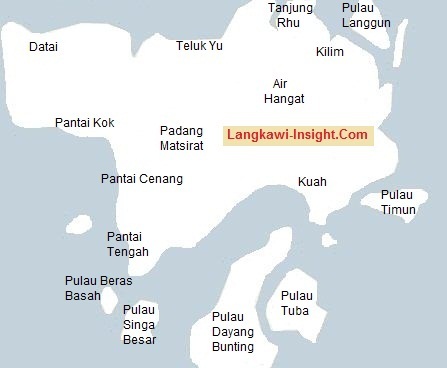 In the following section, you will find Langkawi maps that covering individual subject areas. Use the navigation buttons to move the map, and use the zoom buttons for zooming in or out to see lot more details. The Langkawi Tourism Map below is a very powerful map and can give you great information about beaches & attractions. First of all note the signs/symbols used on the map. For example a sign of a wave indicates a beach or a water area, that of a Tree indicates a parkland or a garden, a House sign would typically indicate a museum or a historical building, a symbol of a Boat means a ferry point or a harbor, and so on. If you click on a symbol, it will give you the name or a short description of the attraction. You will also find a link just below that which will take you to detailed information about the place along with many colorful pictures.